The Space is a pioneer in its area and consists of quality, educational and recognized teaching guiding material. It stimulates values such as: sharing, respecting, and helping amidst laughs and emotions. 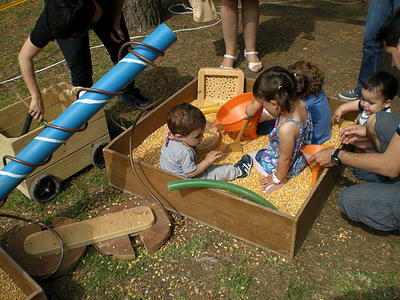 There are different areas: psychomotor activity structures, sensorial playing, building (blocks and jigsaw puzzles), cereals sandy area, and a relaxing and quiet space. The experiencing and free play space is conceived for children between 0 and 8 years old. The Space is a pioneer in its area and consists of quality, educational and recognized teaching guiding material. They disclose around 40 m² to 100m² of playground. All the material are made handcrafted by them with the finest woods and finished with oils and ecological paints. The space consists of different areas that approach children to a world of sensations where they play a leading role. The Space seems built by the children themselves, showing relieve, certainty, curious and movement. All the integrated material and harmoniously combination of them is the result of a suitable quality playground for stimulating young children, in order of waking up their curiosity and enjoying for hours in a natural and free way without guidelines for playing. It stimulates values such as: sharing, respecting, and helping amidst laughs and emotions.